Updated iMacs have been released with the same overall design as before —but with faster processor speeds, greater storage options, and improved GPUs available in custom configurations. As part of its hardware announcements ahead of the March 25 event, Apple has revamped the iMac with two new models that improve on all previous specifications but retain the same physical design of the previous models. In their first update since June 2017, Apple's new iMacs again come in two sizes. The 21.5-inch iMac now features 8th-generation quad-core processors, and can be configured with six-core processors, delivering up to 60 percent faster performance, according to Apple. The 27-inch iMac now for the first time features up to 9th-generation six-core and eight-core processors, delivering up to 2.4 times faster performance. Radeon Pro Vega 20 graphics can be added to the 21.5-inch iMac, delivering up to 80 percent faster graphics performance than the previous model. The 27-inch iMac with optional Radeon Pro Vega 48 now delivers up to 50 percent faster graphics performance. Neither the iMac 4K, nor the iMac 5K have Apple's T2 chip, as found in the MacBook Pro and Mac mini. Both are available to order starting on Tuesday from apple.com and the Apple Store App, and in Apple Stores and through Apple Authorized Resellers the week of March 25. The new 21.5-inch iMac with Retina 4K display starts at $1,299 and the new 27-inch iMac with Retina 5K display starts at $1,799. The non-Retina display iMac configuration continues to be available for $1,099. The base model iMac 4K has a 3.6 GHz quad-core eighth-generation i3 processor, 8GB of RAM, a 1TB hard drive, and a Radeon Pro 555x. A $1499 configuration has a 3.0 GHz six-core eighth generation i5 processor, a 1TB fusion drive and the Radeon Pro 560X. The $1499 configuration can be upgraded with a 3.2GHz eighth-generation i7 processor for $200, and the Vega 20 graphics for an additional $350. Upgrading to 512GB of flash storage retails for $300. A configuration with that i7 processor, Vega 20, 512GB of flash storage and 16GB of RAM retails for $2549, with shipments on April 3. The 27-inch iMac base configuration for $1799 includes a 3.0 GHz six-core eighth generation processor with a peak speed of 4.1 GHz, 8GB of DDR4RAM, a 1TB fusion drive, and a Radeon Pro 570X. A 27-inch configuration is available for $2299 that has a 3.7 GHz six-core ninth generation i5 processor with a peak speed of 4.6 GHz, 8GB of RAM, a 2TB Fusion Drive, and the Radeon Pro 580X. The RAM on all configurations has been upgraded to 2666MHz DDR4, and is user-upgradeable. The i9 processor can be added to the $2299 27-inch iMac configuration for $400, with Vega 48 graphics available for $450. Moving to 512GB of flash storage on the high-end incurs a $100 charge as well. Adding the i9, 512GB of Flash instead of the super drive, the Vega 48 graphics, and upgrading to 16GB of RAM will retail for $3349, with delivery around April 3. Previously, those same base prices got you a 2.3 GHz dual-core Intel Core i5 processor in the 21.5-inch model and a 3.0 GHz quad-core version in the 27-inch model. Both models used to come with a base of 8GB and were upgradeable to 16GB. There was a second version of the 27-inch iMac that had a 3.4 GHz quad-core Intel Core i5 which was also upgradeable to 32GB RAM and cost from $1499. The 21.5-inch version shipped with a 1TB hard drive but could be configured to either a 1TB Fusion Drive or 256GV SSD. The 3.0 GHz 27-inch iMac also shipped with a 1TB hard drive as standard but added a 512GB SSD upgrade option. The 3.4GHz model further added a 1TB SSD option. The graphics in the 21.5-inch iMac were powered by an Intel Iris Plus Graphics 640 processor while the 3.0 GHz iMac ran a Radeon Pro 555 with 2GB of VRAM. The more expensive 3.4 GHz 27-inch iMac had a Radeon Pro 560 with 4GB of VRAM. The previous update to the line in 2017 was also primarily a speed bump but it did replace the older models' Thunderbolt 2 connectors with Thunderbolt 3. Otherwise, the external design remained the same. 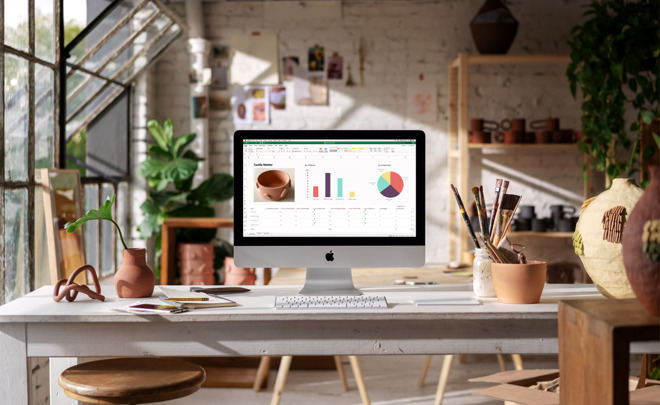 While the iMac line has undergone radical changes over its more than 20-year life, the sole change since 2012 has been the addition of a retina screen in 2014.